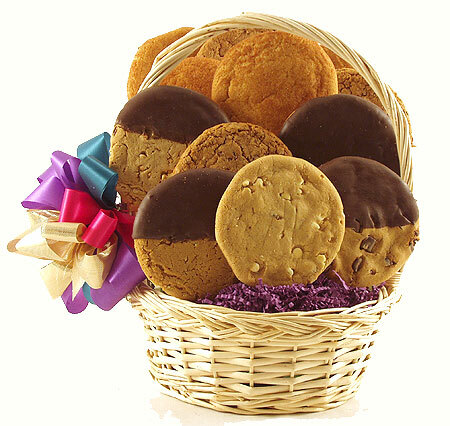 Treat them to a cookie basket filled with a variety of delicious gourmet cookies including Chocolate Chunk dipped in Chocolate, Old Fashioned Peanut Butter dipped in Chocolate, White Chocolate Macadamia, Oatmeal Raisin Cinnamon, and Snickerdoodle. Choose a nine, twelve, eighteen or twenty- four cookie arrangement, great for an office or family to share. Celebrate birthdays, say thank you or just because!